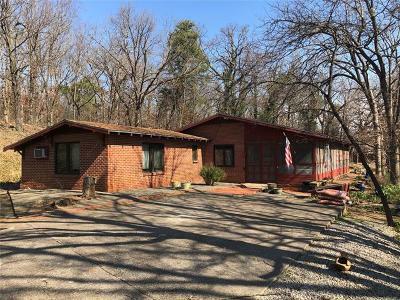 Awesome views from this lakefront home located just North of Fort Gibson Dam! Open concept, split bedrooms, with wood-burning fireplace, quartz counter-tops, lots of cabinets & storage. Lakeside features a patio & large screened porch for gatherings, morning coffees & scenic views. Pella Windows, gas available for your outdoor grilling, 21x22 & 10x20 insulated shops with electric. 28x34 2-well boat dock w/2 hydro-hoist lifts, 8x20 swim dock & 12x34 outside dock! $125/yr HOA. Get your family ready to move!